The dawning of a new, digital dictionary. The Lexicon Lives! But Book, the hologlyphical intelligence behind the Lexicon, has become conflicted – stuck on a single, troublesome suffix. And Professor Osefa, the woman who designed both Book and the Lexicon, has just been found dead. Will the Doctor be lost for words? Will Peri’s vernacular bring proceedings to a grinding halt? What is the Omniverbum? And is the universe ready for lexical transcendentalism? No…ish…Beware. This is not the sort of audio play that you can have chuntering away in the background while you focus on something else. Nor is it the sort of story you’ll like if your idea of Doctor Who involves endless running through corridors to avoid Daleks/Cybermen/giant liquorice allsorts, or mooning over the inscrutable history of his female assistants. 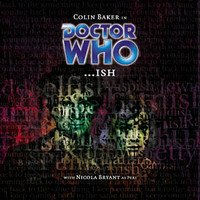 …ish is one of those plays, the ones that taste like Marmite. If Whispers of Terror leaned heavily on the veracity of voice recordings to move the plot along, then the entire raison d’etre of …ish is the spoken word. Phil Pascoe’s script powers through definitions, metaphors, similes and synonyms as the Doctor pursues the truth behind Professor Osefa’s untimely death. This is as high a concept as either the Year of the Pig or The Natural History of Fear (yes, I’m mentioning that one again…), as almost all of the action is actually conversational, the duels between characters literally battles of words. Obviously it only works if you let the words do their job and ignore the fact that this is a very speechy, preachy style of play. It certainly won’t be to everybody’s taste – location and description are put aside in favour of dialogue, for example. But for me, it’s all much better than good…ish.